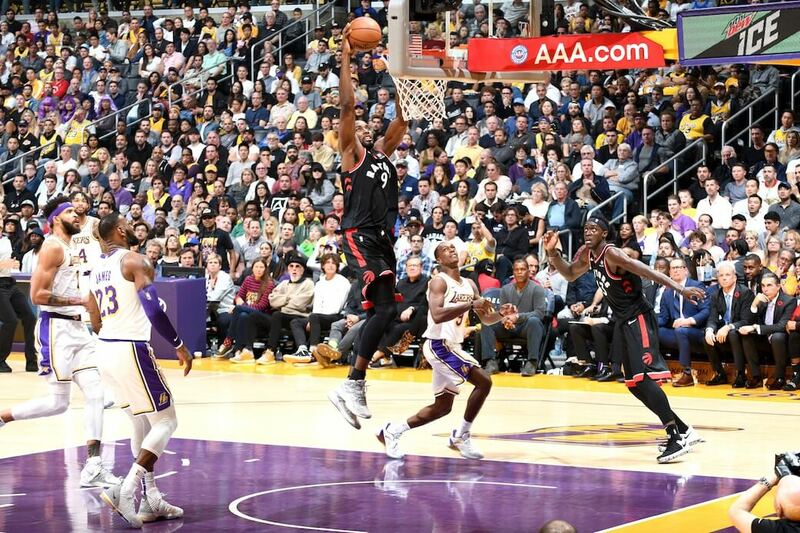 Kawhi Leonard was sitting out the first meeting between the Lakers and the Raptors. These are the two leading teams trying to sign the MVP-caliber player to a long term deal in the summer. For the Lakers, this was a perfect time to showcase their young talent playing alongside LeBron James. For the Raptors, this was a great opportunity to show Leonard just how good he had it in Toronto. Kyle Lowry and Serge Ibaka seized the opportunity and showed in the first 12 minutes alone. The Raptors exploded out of the gates. They set the tone for the entire game in the first quarter. At one point in the first quarter, the Raptors were up by 31 points and shot 70%! Kyle Lowry continued to showcase just how good of a court general he’s been this season. He was dishing out dimes to everyone on the floor. He already had nine assists after the first 12 minutes of action. He finished the game with a game-high 15 dimes. Serge Ibaka picked up the scoring load with Leonard out. He showed his soft touch from the perimeter and rumbled through the lane for strong dunks. By the end of the first period, Ibaka already had 20 points to his name. The rest of the team wasn’t bad either. When the Lakers made a run in the fourth quarter to make it interesting, the bench mob closed the game. Paskal Siakam had 16 points and 13 rebounds. Danny Green score 15 points, all on three-pointers. Delon Wright and Jonas Valanciunas combined for 25 points. The Raptors are one of the most complete teams in the league. And Coach Nick Nurse is putting it all together with creative sets. Today, they fully showcased why Leonard should stick with them in the long run. The Bucks suffered their first loss of the season, against the Boston Celtics. Antetokounmpo played well, but it wasn’t enough to keep the win streak going. Against the rising Kings, Antetokounmpo made sure to do a little bit of everything. The Greek Freak dropped a triple-double in just 30 minutes of action. He scored 26 points, grabbed 15 boards, dished out 11 dimes and even added a steal and a block. Antetokounmpo hit the trifecta. He got his numbers, his team got the win and he made another personal highlight reel. If he continues to play like this and the Bucks continue to win, the Greek Freak could soon be the Greek MVP. The Wizards were absolutely embarrassed by the Thunder in their last game. They were sent spiralling to their fifth straight loss of the season. They needed a win, bad. They got it against the rebuilding Knicks. Everyone on the Wiazards pitched in to get the win. Guys were going out of their comfort zone to help the team John Wall led the team with 26 points, seven assists and protected the paint with five blocks. Bradley Beal had 22 points. With his shooting off, he helped with the rebounding, grabbing eight boards. Markeiff Morris had 15 points and helped the back court move the ball with five dimes. The Wizards players are great at getting their numbers. They’ve proven that. But they need more games like these where they go beyond their numbers and do everything to help the team get the win.